There are times when travelling you are so blown away by a place or an experience that you literally cannot find words to describe it. Our tour around the Komodo Islands falls into this category! For every stop on the tour we could not believe what we were seeing. The variety of landscapes and experiences was unbelievable. 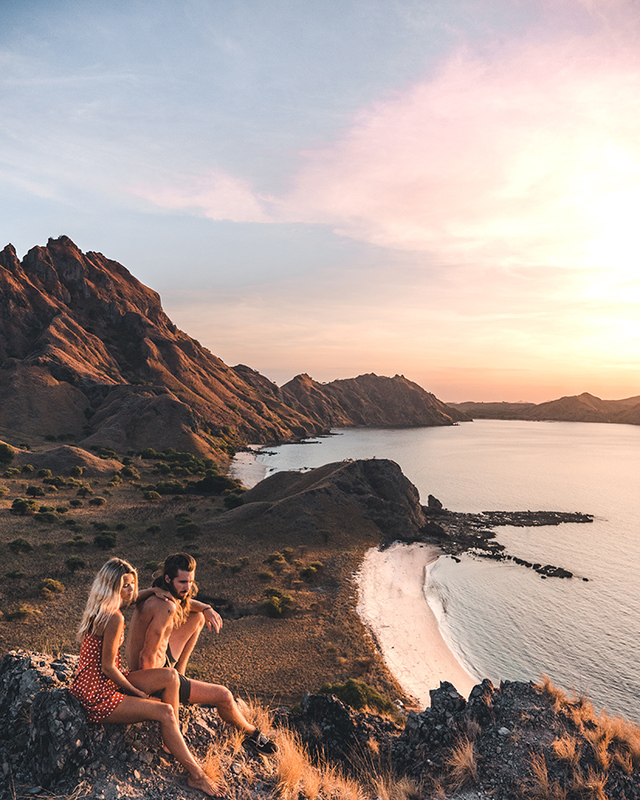 Incredible hiking, epic sunrises and sunsets, jaw dropping wildlife, diving, pink beaches, sand-bars and clear blue skies are just a fraction of what you can expect from the Komodo Islands. Here we have put together our Ultimate Komodo Islands Bucket List to make sure you don’t miss out on the experience of a lifetime. These Komodo dragons have to be seen to be believed. They are huge!! Rinca and Komodo Island are the only places in the entire world that you will find these prehistoric creatures. Growing up to 3m long and weighing up to 80kg these Komodo dragons look like modern day dinosaurs. On Rinca Island a tour guide will guide you around a section of the island to help you find some of these creatures. We visited the island during mating season between the months of May and August. This meant that the dragons were either quite placid to conserve energy or they were already in their holes to lay eggs. We managed to see 4 dragons. The tour guide who is also a ranger on the island carefully overlooked as we managed to get with 3-4 metres of the female dragons. The dragons feed on water buffalo, deer, monkeys and birds, all of which we saw on our island tour. This was an unreal experience. Having watched so many animal documentaries as a child this was a huge tick on the bucket list. It feels like your on set with David Attenborough, just make sure you don’t get to close to those sleepy giants! Padar island looks like something straight out of Jurassic Park. The steep volcanic mountain ranges are surrounded by deep bays which combined, give you a breath taking view from the top. This sunrise was something we will never forget. The climb to the top takes about 20 minutes, by the time the sun is up it can be quite crowded at the top. To avoid the crowds and give ourselves the best chance at getting those Insta-worthy pics, we turned right at the top of the first set of stairs instead of left. We essentially had our own half of the island for all of sunrise. If you like avoiding the crowds this could be for you. You can always hike to the top once the sun is up, the view from the top is still amazing and by then the crowd has dispersed giving you a bit more room to move. Have you ever gone on an adventure to find a ‘pink beach’ only to arrive and find that its not really even pink? Well forget about that here! The Pink Beach, or Pantai Merah which it is also called, is one of seven pink beaches on the planet and this beach really is pink. 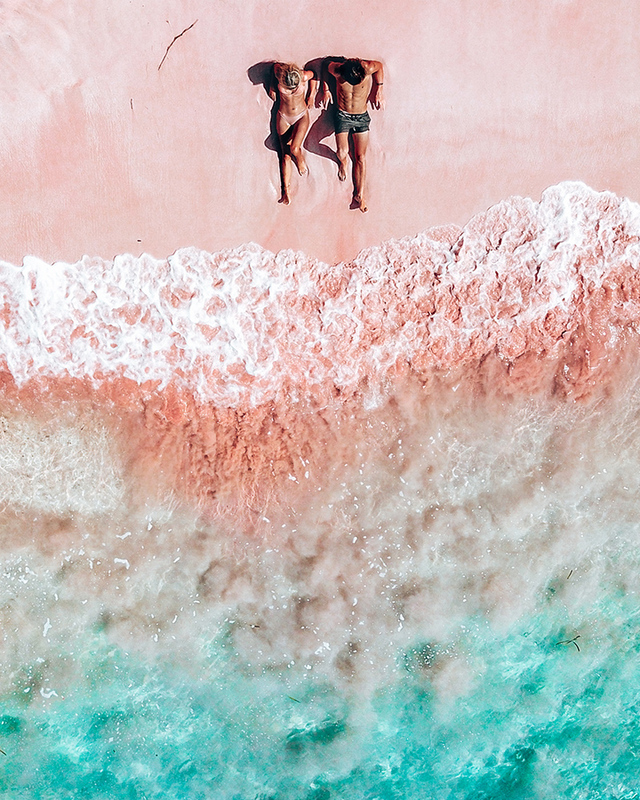 This hidden beach only accessible by boat gets its pink color from microscopic animals called Foraminifera, which produce a red pigment on the coral reefs. Arriving at this beach was like a fairytale. We were the only people on the beach that stretched for 400m. The water is bright blue and as the waves hit the shore it mixes up the pink sand creating a fairyfloss looking effect. Absolutely incredible! This beach is the perfect spot to relax, take some photos, do some snorkelling and just marvel at the beauty of our planet. You will notice that the beach is super clean. Please keep it that way and take our rubbish with you, maybe even pick a few pieces up while your there. As the sun sets over Kalong Island the trees begin to rustle with activity. The boats line up in the calm water waiting for something spectacular to happen. One bat spreads its wings and flies out from the trees. Then 3 bats follow, then 5 more. All of a sudden thousands of bats fill the pinky, purple sky. The bats are flying back to the mainland to sleep over night. This daily migration is one of the most beautiful things we have ever seen and an unexpected part of our Komodo islands tour. You really have to see this for yourself to believe it, trust us when we say that you will be in awe of this amazing event. When we think of paradise, this is what comes to mind. Crystal clear water, bright white sand and your own secluded sand bar to share with other travellers. This sand bar is smaller than a football field and is surrounded by stunning blue water. The water is shallow therefore the biggest cannot get to close which makes it perfect for snorkelling and free diving. Our camera equipment got a workout at this amazing natural wonder. We captured amazing aerial photos and videos with our Mavic Pro, some pristine underwater shots with our gopro 6 and white beach couple shots that never get old on our Panasonic GH4. Take your time to relax or go crazy taking photos, either way you will love this place. As content creators and travellers in general, this tour around the Komodo Islands was something we will never forget. The quality of content we were able to produce and the experiences we had, were absolutely top notch. We want to say a big thankyou to the guys at Travass.Life for making our trip so memorable. We cant recommend them highly enough . They have also offered 200,000 rupiah off of their tour if you mention us (Marie & Jake) when you book or easier use the booking code TRAVASSXMARIEJAKE ! How good is that? Most of our Komodo photos were edited with presets from our Ultimate Preset Package that you can find here! This adventure was the perfect add on to our month long stay in Bali, for an in depth guide to Bali and the surrounding Islands check out this article here!